This name has been worn by popes and heartthrobs alike – but it isn’t Leo. Thanks to Sophie for suggesting Adrian as Name of the Day. Back in the 1970s and 80s, the name Adrian skewed female. That was thanks to Rocky Balboa, boxing hero of the Rocky franchise, also responsible for turning the Philadelphia Museum of Art into the one of the world’s most famous staircases. On the big screen, Adrian was actually short for Adrianna. Most parents who chose the name for their daughters went with the French-fried Adrienne – or even Mrs. Balboa’s formal name. Adrian comes from Hadrian, or Hadrianus – a place name. With the H, he’s quite rare. Without it, Adrian has been in steady use throughout the 20th century. In fact, you’ll find Adrians in the historical record from the Middle Ages until the present time. But the 21st century is Adrian’s moment. As of 2007, he ranked #61. Variant Adrien came in at #843. Perhaps Adrian feels like a more substantial version of Aidan; perhaps he is simply one of the more accessible ancient names experiencing a revival. There have been six popes Adrian, the first in the 770s and the most recent in the 1500s. Toss in a handful of saints and a Nobel prize winner, and this name has quite a bit of substance. Medieval Christians on pilgrimage to Compostela travelled the Way of St. James – supposedly the apostle’s remains are buried at the Galician cathedral. They passed through the San Adrian tunnel en route. Even today, hikers can travel through the ancient passageway. 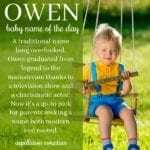 But most modern parents probably hear Hollywood with this name. HBO’s Entourage features Adrian Grenier as Vincent Chase. One of NBC’s Heroes is played by Adrian Pasdar. (He flies!) Adrian Paul played Duncan MacLeod on Highlander. Then there’s Adrien Brody, the youngest actor to ever a Best Actor Oscar. Toss in No Doubt drummer Adrian Young, a bunch of football players and King Crimson guitarist Adrian Belew, and the name sounds thoroughly modern. He’s also nicely pan-European. Adrian ranks in Spain’s Top Ten, charted at #12 in Norway in 2007 and ranked #59 in Sweden that same year. Thanks to the saints, Adrian is recognizable in nearly any European language. With so much to recommend him, it is little wonder he’s caught on. And perhaps that’s the only trouble with Adrian. Despite his distinctive sound, don’t be surprised if you hear a lot of him. I’ve always had a love-hate relationship with my name. On one hand, it was neat being the only Adrian in the ’70s and ’80s, in a sea of Jeremys, Jasons, Chads, Amys, and Jessicas. I was always the only Adrian in my school. On the other hand, I get mail addressed to Ms. Adrian Lastname, people constantly butcher the spelling, and if I had a nickel for every time I heard someone say “Yo Adrian,” I’d me a billionaire! One other interesting note … you know how Damian has never been able to shake the association with “The Omen”? Adrian was the son of Satan in “Rosemary’s Baby,” but no one ever seems to make that connection. Thank goodness for small favors, but I always found it interesting how one name got off the hook for its “evil” Hollywood connotations and one didn’t. Adrienne for a girl and Adrian for a boy are both fabulous choices in my opinion for kids- so classic with the slight aura of uncommon-ness. Adrian very much reminds me of Adrian Monk, and that’s not that bad of an association. I don’t know why I like him – he was my first ‘kiss’ in kindergarten 🙂 I don’t see anything feminine in him at all and I like that he’s sleek and suave and handsome in a somewhat ‘quiet’ way! Plus, I adore Adrien Brody, and Adrian Grenier definitely doesn’t hurt either! I find Adrian a bit feminine, I’ll admit. And it doesn’t even matter that I know so many pop culture male Adrians (including Adrian Monk, of the TV show Monk, a favorite of mine)… What I find really odd, though, is that if I add that H for Hadrian, it instantly beefs up the name for me. Strange and unexplainable, but there you have it. I think Adrian and Julian are the kinds of names that most parents think are unusual – and then realize that everyone else chose them for the same reason! Photoquilty, how cool about the Adrian/Pandora coincidence. I knew nothing about Mr. Mole! Interesting that Adrian followed Pandora. The two were boyfriend and girlfriend in the 1980s young adult novel, The Secret Diary of Adrian Mole age 13 3/4. http://en.wikipedia.org/wiki/Adrian_Mole If I remember correctly, Pandora asked everyone to call her Box. Adrian was Aidy to some. I don’t love either name, but kind of get a kick out of Aidy. I would probably go with Adrienne for a girl before I’d do Adrian for a boy, but having hated/pitied Adrian Mole, and having known a gross Adrian in grade school, it would never get on my list. Also, it sounds girly. I thoroughly like Adrian! Adrien Brody (to DIE for!) Adrian Paul (swoon) and Adrian Belew doesn’t hurt the name either. Just don’t get me started on Rocky’s Adrian. As a kid, I thought Rocky was gay and it wasn’t until captioning on the DVD did I realise Adrian was supposed to be the girls name. Adrienne, people! My goodness. He’s a bit too mainstream for me, personally but I’d joyfully back anyone else considering him. He’s sleek, debonair & completely handsome. I’d rather hear Adrian/Adrien a thousand times a day than Jacob. Adrian’s got panache! I am thoroughly charmed by him and would LOVE to see him get a good reception. Adrian/Adrien gets a wildly enthusiastic :thumbsup: from me! I’d never realized Adrian’s similarity to Aidan, it does seem good for parents who like Aidan but want something less trendy. I like Adrian, it’s a good strong name. I went to school with an Adrian, actually, he was my prom date. He was a really nice kid, and I think the name served him well.